When the French painter Paul Cézanne headed back to the south of France, he was retreating from an art world that greeted his paintings with indifference, but he was also returning to his ancestral home, full of a bright, penetrating light so different from the moisture-laden haze of Paris. Vincent van Gogh, and for a brief period, Paul Gauguin soon followed Cézanne’s move, resulting in the crisp, penetrating light of Provence making it’s way into their paintings and impacting the development of Modernism in Europe. Is it any wonder, then, that the American Southwest, with its equally dry penetrating light, became a destination for America’s modernists? 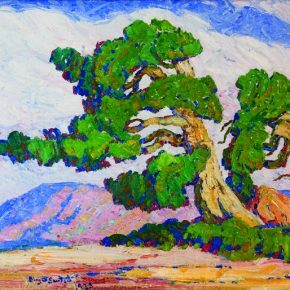 That intense light, in a multitude of variations and mood, is a clear and unifying thread in the exquisite exhibition Simpler, Brighter, Stronger: Early Modernism and Southwestern American Art currently on view at Brigham Young University’s Museum of Art (MOA). Paul Anderson, Curator of Southwest American Art at MOA, drew equally from two collections to realize his vision: the museums’ own collection and the Diane and Sam Stewart Art Collection. The result is a multi-hued jewel of an exhibition with alluring subject matter and regional significance. 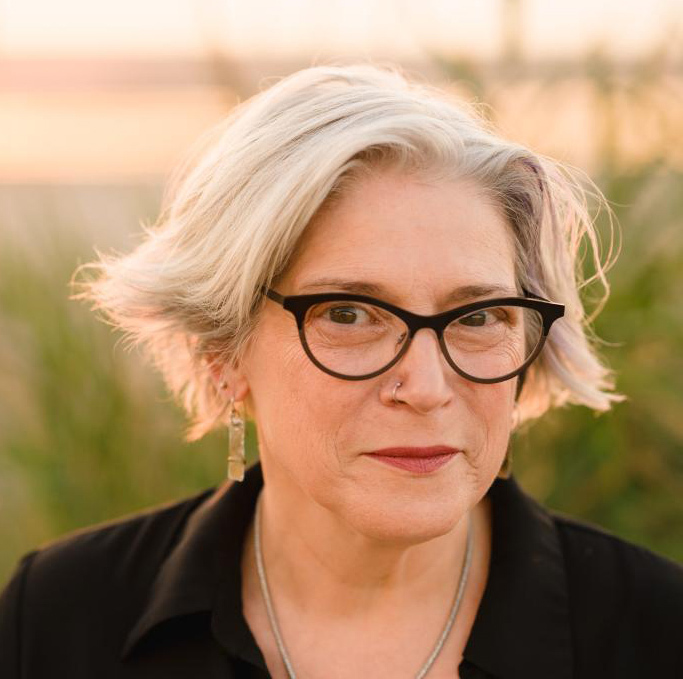 Diane Stewart discussed Anderson’s accomplishments during the exhibition’s opening and the significant role Modernist artists hold in her art collection. She was clearly delighted to note how well Anderson had worked with both collections to provide a seamless narrative, both informing and inspiring the viewer. Anderson has done an excellent job not only in providing a varied panorama of the Southwest during the Modernist era, but in elucidating through didactic panels and exhibition labels the exhibition’s three thematic elements: simpler, brighter, stronger. 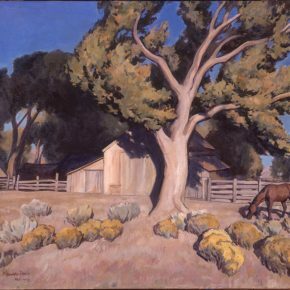 “Simpler” resulted through the artists’ move away from detailed naturalism towards abstraction, “Brighter” was reflected by the radical depiction of the strong sunlight found across the Southwest, and “Stronger” exemplified the bold use of composition and hues that imparted a sense of a vibrant landscape and its people. The storied history of nineteenth and early twentieth century American painting provides us with the influences that led traditionalist painters to leave the world of accurate depiction and employ new colors and abstracted modes of representation. American painters emulated the work of their European counterparts to a certain extent and adopted the practice of painting out of doors. Landscape and light were considered in new ways once painting became portable and artists traveled first close to home, then farther afield to realize their subjects in perfect light. Paul Cézanne was just one artist who used light to its full advantage. His home in the south of France, a region famous for the quality and consistency of sunlight, provided him with endless opportunities to develop his revolutionary, signature painting style. As Cézanne considered the landscape before him, he worked with brighter, stronger colors to depict less delineated shapes, choosing instead to paint the essence of what was before him. His crosshatched application of paint was another move away from traditionalism and towards a new visual expression on canvas. Cézanne was one of many European artists whose work was displayed in New York City at the historic International Exhibition of Modern Art, known simply as the Armory Show of 1913. Over 300 American and European artists were included in this groundbreaking exhibition, which has been credited with bringing European Modernism to the United States through the works of not only Cézanne but Henri Matisse and Vincent van Gogh to name just a few artists. One American artist who endorsed the Armory Show was the photographer Alfred Stieglitz. He promoted Modernism in his own gallery, called “291,” exhibiting American and European artists. 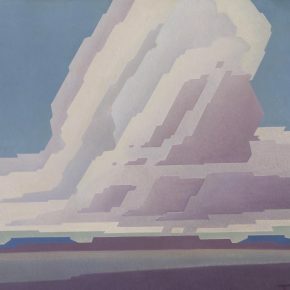 Stieglitz’s initial support of the young artist Georgia O’Keeffe resulted in their marriage and then eventual separation as O’Keeffe found a new passion in her life, which dominated her time and influenced her artistic language for decades: the light and landscape of the American Southwest. The inclusion of European Modernism at the Armory Show was one way new styles of painting made their way to the American West. It could be her name recognition, but I like to think it’s her connection between East coast and West, between European influence and American adoption that led Anderson to place O’Keeffe’s painting “White Primrose” (1947)|2| front and center to the MOA exhibition. 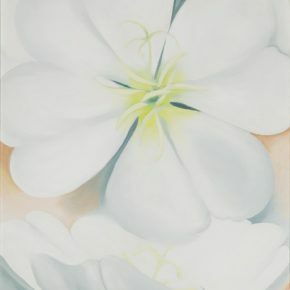 With her signature and singular floral subject — a white flower glowing from an unseen light source — O’Keeffe ushers the viewer into the exhibition and the initial grouping related to “Simpler.” Kathryn W. Leighton’s painting “Wife and Child of Bull Plume” (c. 1925)|3|also exemplifies the idea “Simpler” through its cohesive composition and melding of two figures into one under the bold geometric pattern of a single quilt. No background is needed to distract us from the empathetic portrait before us as “simpler” allows more time to contemplate mood, color, and composition. 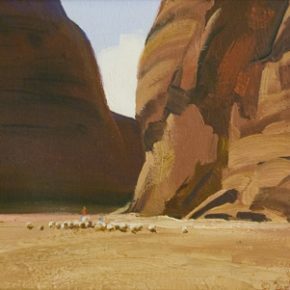 Western landscapes of depth and breadth are interspersed with equally compelling portraiture throughout the exhibition. 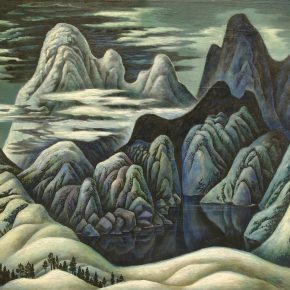 The variety of landscapes range from fantastical forms (see Vance Kirkland’s “Clouds, Mountains and a Lake”|4| for an excellent example) to abstracted vistas of line and form. Paint is applied to canvases in new, gestural ways: modulated transparent hues, thick dabs of impasto, broad bold colors, and energetic slashes. 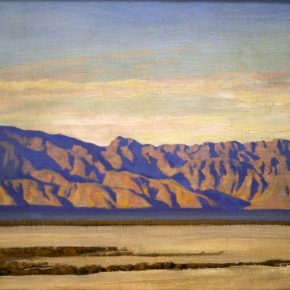 Mabel Pearl Frazer’s “Desert Grandeur” (c. 1940) may be placed with works denoting a “Simpler” style of painting, yet it is bright and strong as well. Her horizontal expanse of the Grand Staircase is rendered in beautiful, bold colors rich in each aspect of sand, sage, rock, and sky. Shape and land take form, connecting us to familiar, often beloved, landscapes. Birger Sandzén’s “Untitled (Trees in the Desert)” (undated) |5|is an excellent regional example of one of the new European modes of applying oil to canvas. His twisted trees exude life through shape and hues applied in discernible dabs. Sandzén’s sky swirls in evocative patterns, drawing comparison (as Anderson cogently does in his wall label) to the work of van Gogh. Maynard Dixon’s “Colorado Desert” (1926)|6|, provides a lovely contrast in not only paint application, but mood through placement and emphasis. Whereas Sandzén provides us with images in the foreground that hold our immediate attention, Dixon presents a distant view of a seemingly barren landscape. Dixon’s magic was to use color to evoke depth and space, allowing the viewer to feel each landscape under his brush was monumental in nature. 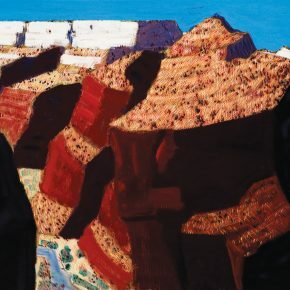 It is a treat to see well-known artists exhibited with those lesser known: it gives us a variety of ways to understand the move towards Modernism in renderings of the Southwest. 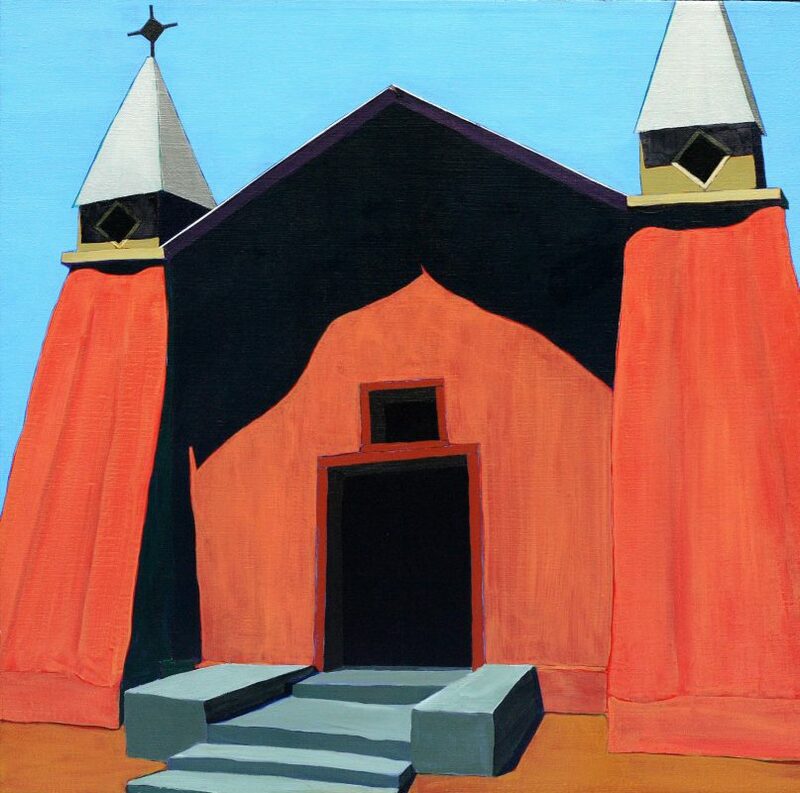 Harold Joe Waldrum’s painting “La Iglesia en Corrales” (undated) |7| is almost graphic in nature. Clean lines emphasize simplicity while bold shadows provide the depth needed to keep Waldrum’s work away from the cliché of poster art. Utah artist V. Douglas Snow (the subject of Frank McEntire’s two simultaneous exhibitions in Salt Lake City, and 2013 publication) is represented with “Stone Mountain”, (1977).|8| It is a gorgeous cacophony of atmosphere rendered in Snow’s virtuoistic manner, where the full force of nature’s sublime is expressionistically expressed. There are portraits interspersed with landscapes, and in closing, Walter Ufer’s “The Washer Woman” (undated) |9|comes to mind as an exemplar of each theme Anderson presents to the viewer. Simpler, certainly, as the naturalistic scene has been made a little less formal through a broader approach to form. Brighter, definitely, as the desert sun washes away most shadows. Stronger, absolutely, as the weight of the washer woman’s load bears down on her, resulting in a strong shadow below her form. The dignity of the woman, performing a menial task, is reminiscent of the French painter Jean-François Millet’s “The Gleaners” (1857), where unidentified women bend and stoop to perform the final stage of harvest, elevated in stature through their monumental stance and presence. During the exhibition’s opening Director Mark Magleby said now is a renaissance moment for the Museum of Art’s Southwest collection. 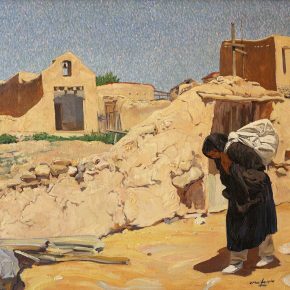 Their extensive gallery space includes not only the exhibition Simpler, Brighter, Stronger: Early Modernism and Southwestern American Art (on view at MOA through July 26, 2014) but also People in a Hard Land: Iconic Images of Life in the Southwest, on view through December 28, 2013. Plan to spend a long afternoon at the museum to take in and savor these illuminating views of our land and our many and varied peoples. It will be time well spent, in the company of inspiring and inspirational art. 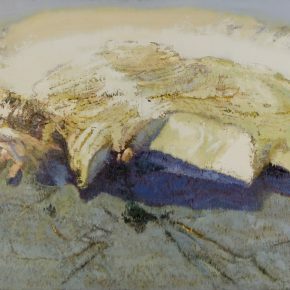 Simpler, Brighter, Stronger, curated by Paul Anderson, is at the Brigham Young University Museum of Art through July 14.